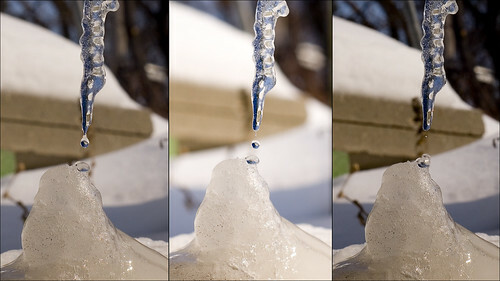 It's an ice pillar in the making. By the time we returned from shopping today (in other news I bought a new handle and fixed the toilet) the two had joined to form an impressive 5' ice pillar beside the garage. If it is still standing tomorrow then guess what my PoTD is probably going to be? I did the usual sharpening, colour correction and slight boosts to the saturation. The cropping and pasting is pretty self-obvious IMO.